All week Legends management struggled and cajoled squad and club members to show up for the noon game on a rare grass field, and they finally succeeded with 14 available against 11 Gjoa personnel. The bad news was that the team resembled a bar bell, with many defenders and strikers but precious few midfielders. In the first half this did not pose as much of a predicament, although the Legends appeared as disjointed as expected with numerous players either playing in unfamiliar positions or with unfamiliar teammates. The veteran Gjoa team managed to snuff out most clear opportunities, with the best chance following a half field run not converted by the usually reliable Sobczak. The breakthrough for Gjoa was unfortunate as an innocuous tackle in the box won the ball but the Oscar worthy performance of the striker convinced the referee to point to the spot. Telly had no chance and it was Gjoa with the half time lead. To his credit the referee had provided the full 45 minutes despite his tardiness, and although Gjoa had one substitute show up CPR still felt that they could wear down the opposition. Exactly the opposite happened. Whatever half time talk Gjoa had clearly worked as almost immediately they scored, taking advantage of the speedily challenged Legends back line. This process was soon to be repeated again and again. Even when the veteran Legends dropped further back the speed and skill of the attackers combined with the unfamiliarity of the Legends unit left striker after striker open in the box to take target practice. All of the worst traits of some of the Legends showed up. The complete silence and lack of communication. The gross positional indiscipline. The inability to make the simple pass resulting in having the ball stripped again and again. Not tracking back after coming up for an attack or set piece. 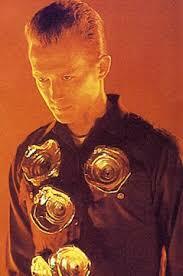 It was a greatest bad hits edition, each mistake gleefully punished by Gjoa. The most the Legends could muster was a couple of tame shots on goal and a ball cleared off the line. The second half was certainly not one for the CPR memory but it was one for the history books, 6 goals conceded and the first game in 2 years that the Legends have been shut out. It’s unlikely that the Legends will play another game this season with all of their starting back 4 missing, and given this evidence they better hope that is the case. Old Man of the Match: All of the weak points of the Legends came out in this game, there were no winners here. Sobczak played hard for 90 minutes but was unable to get the service and convert as he was able to do previously. Statistic of the week: Several statistics, all bad. First time in 27 games that the Legends were shut out. Biggest loss, most goals conceded in a half. 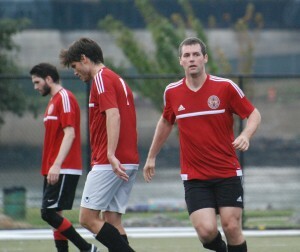 CPR Men’s Red Reserves lost 0-2 to NY Ukrainians. CPR Old Boys lost 1-4 to NY Greek Americans. Goal- new dad Engler. CPR Legends were thumped by SC Gjoa 0-7. After a closer than needed win against the bare bones Manhattan Celtic last week the Legends were hoping to continue the momentum against one of the Barnstonworth teams, in this case the Old Boys. Their result had been a 1-1 draw against perennial whipping boys Banatul the previous week, but the large squad warming up didn’t seem of a low quality. A couple of the CPR Old Boyz pointed out that they recognized players from the first division on that team, an ominous portent. This explained why when the Legends tried their version of the old man pressing game the usual panicked mistakes at the back failed to materialize, and in fact it was Barnstonworth who were causing more issues with movement and communication. Although the contest started evenly the Old Boys started turning the screw, with a well taken first goal ruled out marginally for Off Side. Soon after, an immaculately taken free kick was ruled out by the fussy referee for not waiting for the whistle, a nice get out of jail free card for the Legends. Unfortunately the Legends were unable to take advantage of their good fortune. A combination of the two starting center backs out combined with the lethally quick striker for the Old Boys provided a quick 1-2 punch and two goal lead before half time. With Barnstonworth now controlling the tempo and the Legends disjointed, half time arrived at the right time. The second half saw better rotations and CPR starting to pull themselves back into the game. Play in the final third started to improve and genuine chances started to materialize, but the Rovers showed themselves capable of snatching one too. Sobczak was rewarded for his physical labour with a touch that Solinas slid between the goalie’s legs to pull the contest back to a knife edge. The tension ramped up as a few hard tackles went in on each side, with the referee’s coin toss combined with who yelped loudest determining the free kick roulette. The Legends crept closer and closer but could not quite put the finishing touch in. It appears the overall quality of the league has risen, and so the Legends will have to play close to optimally to expect to get a win on a weekly basis. Promising signs remain, but with Cozmos picking up where they left off the fight for the remaining playoff spot will be very tight. Old Man of the Match: Not a horrible performance but not a great one either, partly due to curious sluggishness and partly due to competent opponents. Statistic of the week: Nothing notable, with Sobczak continuing to be prolific in his second game and the Legends continuing to score but not quite enough. Team Bar Night: 3 out of 5. A third of the team made it to the bar but stayed for the entire Giants game. Some extra UWS shenanigans happened for several hours after that. CPR Women’s White beat CPR Women’s Red, 2-0. Goals: Klara Jenkins and Cat Verri. 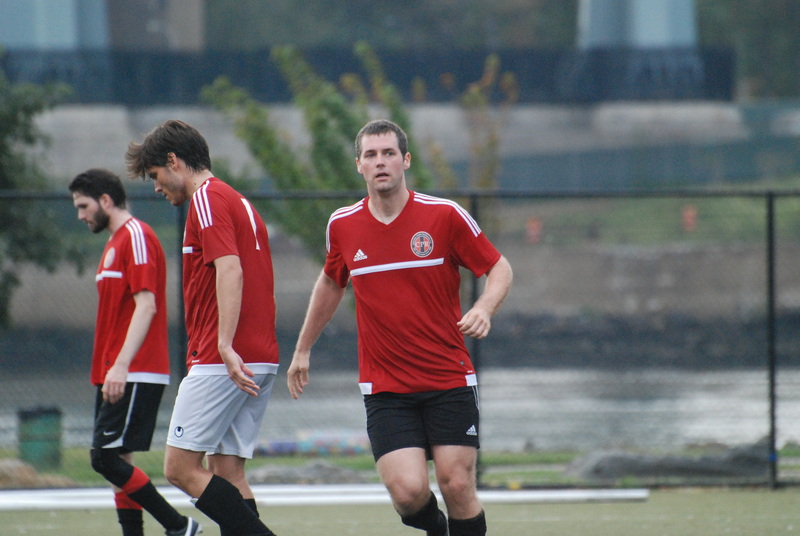 CPR Men’s Red fell 0-1 to Hoboken FC 1912. CPR Grays lost 1-4 to BW Gottschee Over 30. Goal: ? 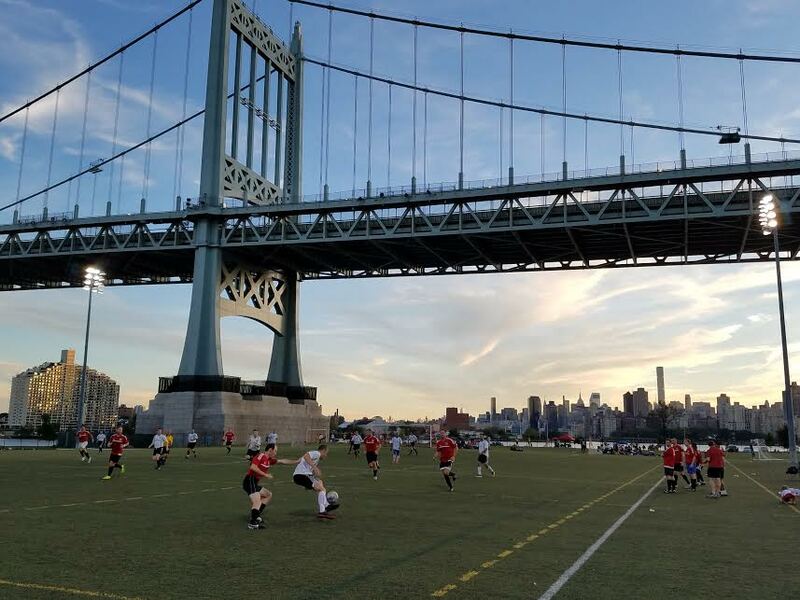 The Legends had a chance at relatively immediate revenge against the Manhattan Celtic Legends, the final opponents of last season’s pitiful spring underperformance. The offseason had seen a couple of new additions but also some significant losses in the reliable (if almost unbearably vocal) Vamvouris twins. Recruitment of a new full-time goalie had come to naught, issues compounded by the new enforcement regarding eligible underage players meaning there would be no filling in from other teams. With goalie chores being passed around like a hot potato ‘El Presidente’ as his wont stepped up to the plate to volunteer as tribute. A few latecomers meant there was still a solid 11 to start against the 10 of Manhattan Celtic. Last season the numerous entreaties to start strongly with a high tempo produced fitful results, but in this case the call was heard as the Legends started the game like a house on fire. High pressing combined with quick aggressive passes gave CPR an early lead as Sobczak stamped his debut with an authoritative finish. More pressure resulted in a corner which Pattinson served up on a platter for Ollie Roberts to score, a similar chance spurned in the second half. With Celtic in disarray a searching cross from Mckeown went across goal with Sobczak producing a sharply hit ball from a tough angle. The initial save popped up for D’Andrea to head into the net. At 3-0 in the first 10 minutes it looked like the rout would be on, especially since Celtic now had only 11 players but no substitutes. Remarkably now that both teams were even Celtic were able to not only staunch the bleeding but started stamping their own authority on the game. The Legends pressing slackened and the Masters showed what they could do when presented with time on the ball with a combination of triangles and searching long balls. Faherty was soon put on the spot having to make a couple of saves, but the first goal concession was a cruel own goal (is there any other kind?) as Belizan looped an unstoppable header into his own net. 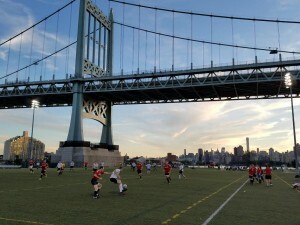 Manhattan Celtic drew strength from the goal and the Legends tried to rouse themselves back into the game. At the half CPR once again were encouraged to focus on pressing to turn defence into offence with the cast iron truth that Celtic simply could not maintain their level of energy for 90 minutes. Indeed, in the first few minutes the Legends once again harried and stripped balls, but the final ball or finish was found wanting. Meanwhile contradicting all accepted standards of fitness for an Over 37 league Celtic continued to run tirelessly and create chances. Only a combination of wayward finishing and inspired goalkeeping kept the margin at 2. Finally the Legends were able to get the critical 4th goal, pressure and numbers producing a slice shot from Hodges directly to the sniper Sobczak who made no mistake. Celtic however refused to just sit down and quit, pulling a goal back from an exquisite free kick. At the end it was the Legends who felt relieved despite the scoreline. A winning start is a winning start, and there was much to be encouraged by. Having a highly capable striker now opens up the field for everyone else, and the news that the Vamvouri were back now plugs the gaping hole at the back (despite El Presidente’s heroics, season long expectations would be too much to handle). Despite playing part of the game with 10 and the rest with 11, Manhattan Celtic Legends just wouldn’t stop running. Mike D’s aka No Shows: Steve Roberts, unusual non-communication. Old Man of the Match: It took only a couple of minutes for Sobczak to celebrate his debut with a goal. Another assist and goal were to come, along with proving a constant thorn in the side of the Masters. Dropping deep but also making runs behind, Sobczak looks to be the #9 the Legends have been missing since Rich Enticott departed for Colorado pastures. A strong honorable mention goes to El Presidente Faherty for making some genuinely startling saves and keeping the Legends in the game. Other notable performances were Belizan and Hahn. Statistic of the week: D’andrea takes over sole all time goal scoring lead from Venkataraman, with Mckeown nipping at their heels. An unfortunate own goal leaves Belizan in the rarely seen negative points for the season, and Sobczak’s debut onslaught vaults him up to #39 on the all-time points list out of 77 players with appearances. Team Bar Night: 2 out of 5. Hard to make a case to go to the bar after an 8pm game, but at least one round was had. CPR Old Boys beat the CPR Grays 4-0 in the first derby of the season.